Shortly after reviewing the Gonville & Caius Chorus vel Organa CD (here) and the unrelated Spellweaving CD of ancient music from Scotland (here), I noticed that the opening concert of the London Festival of Contemporary Church Music would be combining some of the musicians in one event. The first half was of extracts from the Chorus vel Organa CD, based on music, mostly by Ludford, from the mediaeval Royal Chapel of St Stephen in the Palace of Westminster. Magnus Williamson’s clever reinterpretations of the organ verses that form an integral part of the music were played by an organ scholar on one of the St Pancras organs, a very different sound and temperament to the copy of a mediaeval organ used on the recording. The choir did well to cope with the different pitch and tuning. The Gonville & Caius choir have previously worked with some of the instruments from the Spellweaving CD, and featured music in that idiom in the second half of their concert with the distinctive sounds of the Northern Triplepipes, Lyre, Aulos and ancient bone flute and the Deskford Carnyx, the Lochnashade Horn. The triplepipes were a predecessor of the bagpipe, and are based on examples from Sardinia. 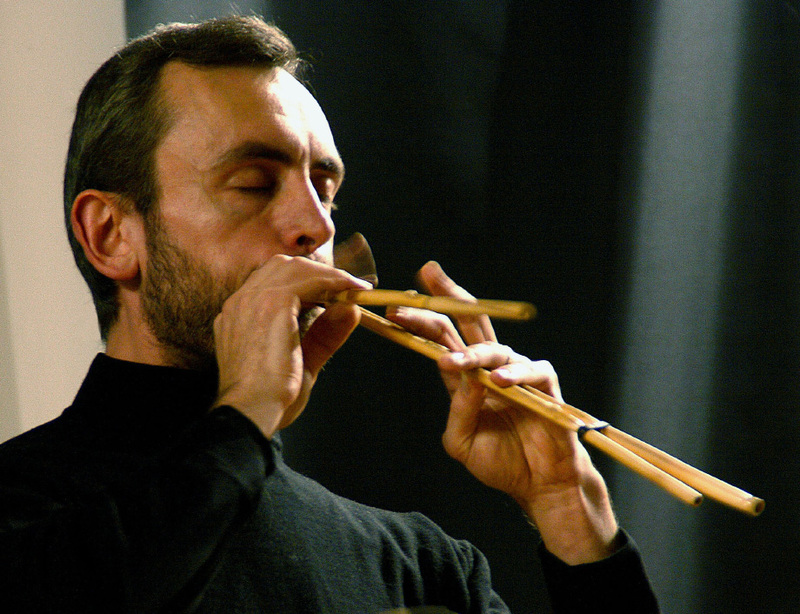 The bone flute is a copy of a 30,000 year old original. The carnyx is the rather scary Celtic and proto-Pictish instrument with the head of a now extinct variety of wild boar and intended, through sound and appearance, to challenge an enemy. The horn is a large semi-circular instrument with a lotus flower decoration, based on a 2,500 year old example. James MacMillan’s powerful and evocative Noli Pater opened the second half, contrasting the sound of the choir, organ, and the triplepipes played, as on the Spellweaving CD, by Barnaby Brown. The choir relished the dramatic climaxes of this piece, notably the shouted Manet in meo corde section. After a demonstration by Barnaby Brown of the vulture bone flute, came the rather lengthy Cry of the Deer, written by John Kenny, rather too obviously as a vehicle for demonstrating his own playing of the Lochnashade Horn and Deskford Carnyx. Based on a poem by St Patrick, it opened with the unusual sight and sound of a pair of organ scholars tinkling away on Hari-Krishna bells. John Kenny gave himself a grand entry by walking around the church with his horn, and later with his carnyx before settling down and proclaiming much of the text himself, albeit twice knocking over a large set of tubular bells that he had been bashing with some glee. Far more successful compositions came from Stephen Bick and Francis Grier, the former with the world premiere of Set upon the Rood, successfully combining the sound of the choir with the lyre and double pipes. Stephen Bick is a member of the choir and not surprisingly featured his own impressive tenor voice in the piece, although in this case there was no evidence of the self-promotion that had been so apparent in the previous work. Francis Grier’s Cantemus concluded the evening, combining choir and Barnaby Brown’s triple pipes. The Gonville & Caius choir were on excellent form in an extremely difficult programme. Although in the earlier pieces there was some evidence of the soprano vibrato that I commented on in the CD review, that didn’t affect the later works nearly as much. It is an amazing achievement for such young singers (aged between about 18 and 21, and with one-third of the choir changing every academic year) to produce such excellent results. Geoffrey Webber managed to keep the whole thing together – not an easy task with a very challenging programme.